As humanity defines itself through an animal other, one could likewise claim that the human in sf texts is demarcated by being non-alien. This viewpoint establishes an intimate connection between alien and animal, both representing the other, that which, in Jacques Derrida’s definition of “absolute alterity,” cannot return the human gaze. While one might expect that this absolute alterity harbors the posthuman potential for overcoming the species boundary through an alien-animal bond, the interactions between alien and animal alterns in Star Trek actually belie the franchise's utopian promise of multispecies community. Examining alien-pet relations in Star Trek: The Original Series, The Animated Series, and The Next Generation through a triangular structure of interconnected becomings, this paper argues that, while convergent and divergent becomings complicate established dualisms, the affective alien-pet interrelations in Star Trek ultimately effect a becoming-human for humanoid aliens while they mark the nonhuman animal as absolute other. Complementing Star Trek scholarship that calls the series’ status as inclusive utopia into question, this article likewise unmasks Star Trek as a distinctly humanist utopia that eventually promotes an anthropocentric position in the representation of animals as much as in the representation of other alterns. 1Two decades before the crew of the original Enterprise set out to “boldly go where no one has gone before,” nonhuman animals—fruit flies, to be more specific—embodied Star Trek’s final frontier motto in real life by being the first earthly beings in outer space (“Cosmic Menagerie”). In fact, in a comic reference to this motto, chief engineer Trip follows Captain Archer’s dog Porthos with the words “where no dog has gone before” in the Star Trek: Enterprise (UPN, 2001–2005) episode “Strange New World” (season 1, episode 4).2 Not only does this humorous meta-reference recall the first dog in earth orbit, Laika, but its mocking tone pinpoints the ambiguous representation of pets in Star Trek that forms the basis of my argument in this essay. 2In the decades following the debut of Star Trek (NBC, 1966–1969; now referred to as Star Trek: The Original Series), Star Trek would develop from a cult show to a successful multimedia franchise, presenting a multispecies utopian future to a global viewership. It is not only in terms of its setting in outer space that Star Trek went where no one has gone before: Part of the series’ success is ascribed to its inclusion and innovative treatment of alterity in various forms.3 The shift from “man” to “one” in the series’ motto between TOS and The Next Generation (syndicated, 1987–1994) is testament to a further development in this regard, especially considering gender politics. “One” is inclusive of any one subject, my point here being that animals were (unwilling) pioneers of that spirit of exploration and quest that was and is ascribed to and decidedly constructed as human. 3By and large, Star Trek’s various series and movies focus on an inclusive, multispecies society of the twenty-second, twenty-third, and twenty-fourth centuries that has established an interstellar, democratic state, the United Federation of Planets, and managed to do away with most contemporary causes and issues of inequality via technological progress and interspecies community (Barrett and Barrett 61). Resting on an enlightened humanism, the series offers a utopian, mythical vision of species coexisting in harmony which represents, according to Rhonda Wilcox, the “ability to embrace the Other” as its “essential credo” (88). In this essay, I will demonstrate that Star Trek’s portrayal of the interactions between humans and nonhumans cannot be interpreted with quite as much optimism when considering a particular “other,” namely the animal. 5Star Trek’s alien/android-pet interactions thus present a perfect venue for investigating the questions raised by the posthuman condition, which, according to Theodora Tsimpouki, Konstantinos Blatanis, and Rachele Dini, “arises as a result of the increasing intermingling of humans and intelligent technology on the one hand, and the dissipation of differences between humans and other species on the other” (4). While Braidotti grants a capacity for overcoming anthropocentrism to posthuman multiplicity and community (71), my essay will show that, while complicating established dualisms, seemingly posthuman becomings in Star Trek ultimately fall short of the posthuman promise of egalitarian community and mutual transformation. 6At the same time as acknowledging Sherryl Vint’s claim that representations of aliens and animals in sf texts may offer a non-anthropocentric, posthumanist perspective, I argue that alien-animal interrelations in Star Trek provide a look at the animal via the alien. They thereby turn the alien into human in what becomes a perpetuation of the aforementioned separation of animal and human. However, this process of humanization of the other is not a linear evolution of identity and allegiance but an ongoing, rhizomatic activity of (dis)connection and negotiation of multiple and fluid identities, leading me to appropriate Gilles Deleuze and Félix Guattari's philosophical concept of becoming. I propose multiple, mutually-transformative, interconnected becomings of pets and posthuman aliens in Star Trek that may be convergent and divergent, but are temporary and fluctuating rather than permanent. If Deleuze and Guattari’s logic follows that “a nonhuman animal cannot come to be other because ‘the animal’ is becoming” (Iveson 39), I will show that the animal in Star Trek actually becomes utterly other while generating a becoming-human for posthuman aliens. My application of Deleuze and Guattari’s concept to Star Trek thus presents converging and diverging becomings via language and affect that set off a divergent becoming for nonhuman animals. The power that pets are endowed with, therefore, is the power to effect a becoming which is not their own. Similar to nonhuman animals providing human access to becoming in Deleuze and Guattari (Iveson 43), pets in Star Trek provide an entry into becoming-human for alien others. 7Complementing Star Trek scholarship that calls the series’ seemingly inclusive multispecies utopia into question by pointing out colonial undercurrents and underrepresented minorities beneath innovative—from a 1960s point of view—portrayals of alterity, my article likewise unmasks Star Trek as a distinctly humanist utopia. The representation of nonhuman animals uncovers a normative humanism that conflates Western, and especially Anglo-American, with human and is thus another instance of Star Trek not living up to its utopian, posthuman promise. Whereas the franchise presents many extraterrestrial species, it uncritically fuses, even in its portrayal of individualized pets, the animal into a single category, isolated from both humans and humanized aliens.5 The incorporation of animals in Star Trek is thus testament to a continuing need to “recuperate” the human (Kern 99) by setting it apart from the nonhuman animal. 8I identify three intertwined becomings, which are not to be seen as linear-progressive, but may be divided into representations of (1) alien-as-animal, (2) animal-as-alien, and (3) alien-as-human. Thus, even in the portrayal of these “shifting … categories of inclusion and exclusion” (Vint 51), Star Trek perpetuates a human exceptionalism whose roots lie in the single human-animal boundary. 9The representation of animal alterity in Star Trek takes various forms, many of which have the animal and the alien intersect: A great number of episodes feature terrestrial as well as extraterrestrial animals, animal-like aliens, and anthropomorphized pets. In fact, despite the occasional reference to animals used for food or experimentation, Michéle and Duncan Barrett observe that the only animals seen on board of Star Trek ships are pets. The fan wiki Memory Alpha lists 26 named pets in the franchise’s television series, four of them recurring: Data’s cat Spot, Captain Picard’s lionfish (informally named Livingston by crew and fans), Captain Archer’s Beagle Porthos, and Chief O’Brien’s cat Chester (“Individual Animals”). Importantly, these four animals are all terrestrial individuals (as are their owners, with the possible exception, depending on definition, being Data) and carry names (with the exception of Picard’s lionfish, which is never referred to by name intradiegetially). Compared to the human-pet relations, the interactions between Data and Spot take up significantly more screentime. 10In addition, various episodes present storylines of animal-human reversion. Some form of hierarchy can usually be detected in the portrayal of these interactions, although it is reversed when used for humorous effect or in stories where humans are treated like animals. Complementing these episodes of human-animal reversion, a very recent publication, Star Trek Cats (2017), completes the triangular structure of my analysis by providing the human-as-animal aspect. 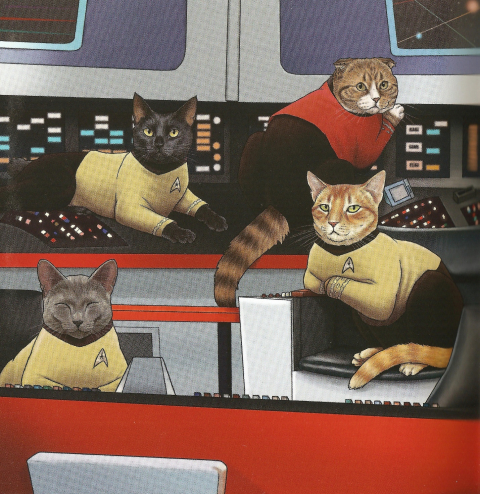 Contrary to what the title suggests, namely an investigation into Star Trek’s feline characters, such as Spot, it is in fact a reconceptualization of human Star Trek protagonists as cats (see Figs. 1 and 2). Illustrator Jenny Parks’ drawings envision the human crew as human-feline hybrids, endowing them with speech and adopting the characters’ usual linguistic habits and mannerisms on the one hand but presenting typical feline traits—including Scotty licking a bottle of “Scotch milk”—on the other. Combining extraterrestrial and terrestrial pet, the cat crew is visualized in their interaction with tribbles, a small, furry alien species. Figs. 1 and 2: “Where no cat has gone before”: The crew of the original Enterprise reimagined as cats. Images taken from Jenny Parks’ Star Trek Cats © Chronicle Books, 2017. 11The human-turned-pet crew in Star Trek Cats themselves interacting with pets points to the aspect which unifies alien and animal in Star Trek: their treatment by human characters. Yi-Fu Tuan argues that an essential dialectic of dominance and affection informs the pet dynamic. The same can be said, to a certain extent, of parent-child, or any other kind of caretaker relationship. In this way, then, posthuman aliens become human children at the same time as they become pets in Star Trek.6 The benign indulgence with which they are mostly treated by humans contradicts their status as autonomous, sentient adult beings. Likewise, the way in which they learn to adapt to what is essentially a human community—their socially inept behavior and seemingly “innocent” outlook are oftentimes exploited for comic effect—is reminiscent of the learning curves of children. The stories of Star Trek’s posthuman alterns, chiefly android Data, Vulcan Spock, former-Borg drone Seven of Nine, and the holographic Doctor are thus stories of initiation and interpersonal growth. In the cases of Data, Spock, and Seven of Nine, obvious parental figures are the respective captains (Picard, Kirk, and Janeway) who all happen to be human. A commonality between these posthuman figures as well as between them and pets is their liminal status: Data is an android, a synthetic life form constructed by a human, who strives to become human, while Spock is a human-Vulcan hybrid—his father Vulcan, his mother human—who struggles with his hybridity and usually renounces the human (read: emotional) part of his identity, favoring the Vulcan (rational) one. While my analysis will focus on these two characters, contrastive examples—in regard to their treatment of pets—are Worf in TNG, the holographic Doctor in Star Trek: Voyager7 and, to a lesser degree, T’Pol and Phlox in Star Trek: Enterprise.8 While Spock is a human-Vulcan hybrid who grew up on the Vulcan home world, Worf is a Klingon who was raised by humans after his biological parents died. In their longing, Spock and Worf are diametrically opposed to Data: Whereas the android’s ultimate goal is to be human, Worf and Spock reject their human sides and continually stress that they are not human (while their representation belies this insistence and frequently shows their distinctly human behavior).9 Interestingly, these affiliations are mirrored in the characters’ pets: Data owns a terrestrial feline, while Spock’s (former) pet is extraterrestrial. 12On the whole, humans treat aliens with the same mixture of benign indulgence, dominance, and affection that these aliens treat (their) pets. Indeed, I claim that both their childlike status and their bond with animals turn these alien others into some of the best-loved characters in the Star Trek universe (Barrett and Barrett 166). Seven of Nine’s rehabilitation from Borg drone to full human being in VOY is paralleled by her friendship with a mixed-species child, pinpointing the close connection between posthuman hybrid and child hybrid. Their otherness, their naiveté, and their liminal status link these characters. 13Steve Baker ascribes boundary-blurring on a different level to a particular animal: the pet. For Vint, “Pets, like aliens in sf, speak to a longing on the part of the human species to connect with another being we can recognize as a subject, but whose mode of being in the world is nonetheless different from our own” (52; my emphasis). Deleuze and Guattari exclude the pet from their theorizing, claiming that animals that are too closely linked with humans do not challenge human ways of thinking. I, however, maintain that placing these two others—alien and pet—alongside each other results in polyvalent connections and disconnections that complicate binary oppositions. 15Similar to the illustrations in Star Trek Cats drawing parallels to the physical appearance of the human characters (see Figs. 1 and 2), Data’s golden uniform and yellow eyes could be argued to reflect his orange tabby’s fur and eyes, and Worf’s and Spock’s pets respectively reflect the Klingon and Vulcan cultures. Worf’s targ, the Klingon version of a boar, is a particularly evocative case in point by being clearly marked as a “warrior pet.” Nevertheless, targs are unusual pets, as they are also hunted and serve as food to Klingons. More so than terrestrial cats, targs and sehlats are thus ultimately liminal animals, challenging the boundary between wild and domesticated. 16As this section has demonstrated, a triangulation of liminality, dominance, and affection governs both the alien-pet dynamics and the alien-human interactions in Star Trek. Pets inhabit a hybrid role as much as these posthuman aliens who become pets at the same time as they become human children. 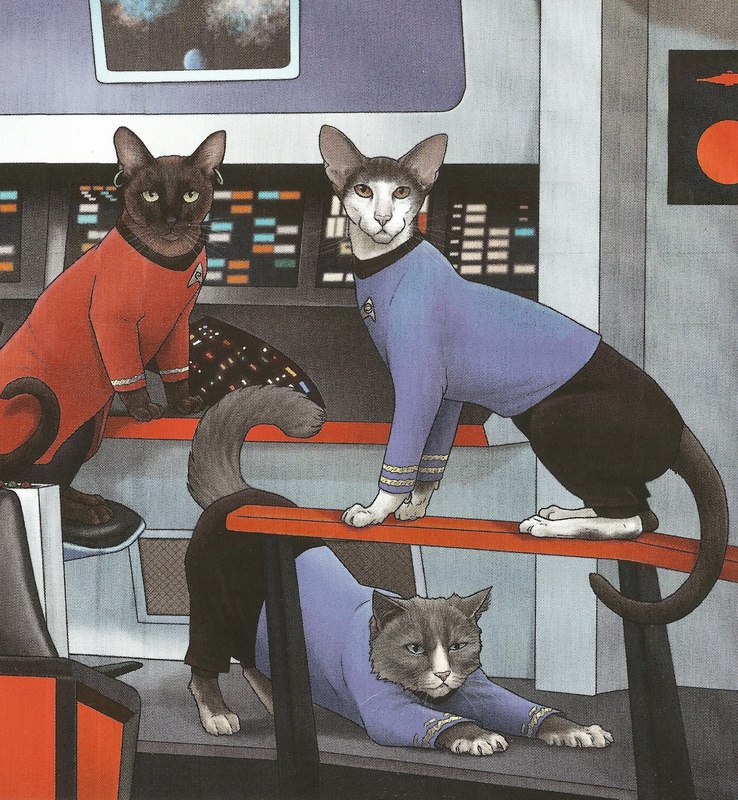 The human-turned-feline crew in Star Trek Cats presents a noteworthy addition, pinpointing the important interconnections between humans, aliens, and pets. 17So far, I have considered individualized, named pets as portrayed in Star Trek. However, what many viewers think of as the “quintessential Star Trek animal,” due to its memorable first appearance in TOS and numerous references throughout the franchise, is an extraterrestrial pet that hardly occurs in the singular. Tribbles, “fur balls” in the truest sense of the word, are pets-turned-pest featured in the comedic TOS episode “The Trouble with Tribbles” (season 2, episode 13), as well as in the TAS sequel “More Tribbles, More Troubles” (season 1, episode 5) and the DS9 episode “Trials and Tribble-ations” (season 5, episode 6), among others. Dr. McCoy: It is a human characteristic to love little animals, especially if they’re attractive in some way. Spock: Doctor, I am well aware of human characteristics. I am frequently inundated by them, but I’ve trained myself to put up with practically anything. Dr. McCoy: Spock, I don’t know too much about these little tribbles yet, but there is one thing that I have discovered. Spock: What is that, Doctor? Dr. McCoy: I like them... better than I like you. Spock: They do indeed have one redeeming characteristic. Spock: They do not talk too much. 19The humorous banter, which is characteristic of the Spock-McCoy relationship, finds McCoy as well as Spock distancing himself from the other by using an indirect insult. Spock articulates preference for the silent pets by contrasting them with the speaking human. Both thus align themselves with the pets rather than with the other crew member. However, on the meta-level, the dialogue constitutes a language exchange between two beings who obviously share the same form of communication; or, rather, whose languages are translated by the Star Trek device of the universal translator.11 This sf tech conceit clearly marks animals as without a translatable form of communication, differentiating them from alien beings.12 Setting language, the “anthropological tool par excellence” (Braidotti 67), and emotion apart, “the animal is a primary agent of the inarticulate affect-phrase” for Lyotard (qtd. in Lippit 49). Affect is the second significant aspect to consider in the above exchange: McCoy identifies the love of pets as a particularly human characteristic, which, in another scene, exposes Spock’s humanity (overriding his rational Vulcan half): Petting a tribble, Spock remarks that the tribble’s “trilling seems to have a tranquilizing effect on the human nervous system,” adding that he—being Vulcan—is, of course, immune to this. However, while uttering these words, it becomes obvious that he is, in fact, affected, as he pauses while speaking and almost enters a trance-like state (“The Trouble with Tribbles” 16:04–16:16). 21In contrast to the example of the convergent becomings of Spock and tribbles, language and affect are decisive tools of othering the animal in the following example from TNG. 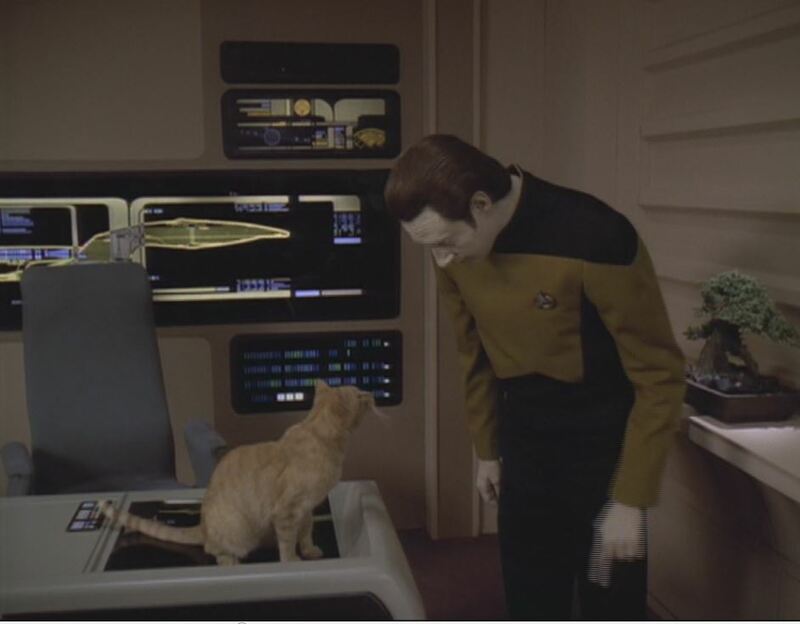 In “Schisms” (season 6, episode 5), Data recites a poem he wrote to honor his pet cat. Again, the scene is exploited for humorous effect: Riker falls asleep during the performance and applauds before Data is finished while cross-cuts to the other crew members listening to Data’s recital show bewilderment and amusement at his poem. It is obvious that nobody is entertained or takes Data’s poem seriously and instead hopes for the performance to be over soon. In fact, the mixture of slight annoyance and benign indulgence mirrors the treatment of pets and children alike, as pointed out above. 22Data introduces his poem by informing the audience that poets used to compose odes to “individuals who have had a profound effect upon their lives” (02:45). The piece of creative writing suggests that it is also a profound affect the animal has on Data. It often serves to illustrate the state of your emotion. 23Even though his friend Geordi LaForge, when asked later in the episode by Data whether the poem produced an “emotional response” (08:17) in the other crew members, answers in the negative, I argue that it does in the viewers. 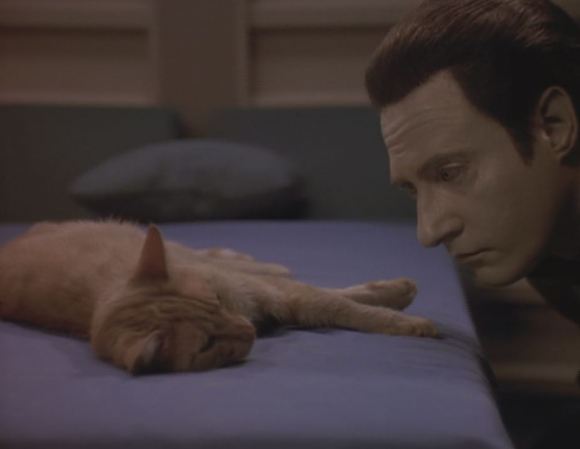 Data articulating feelings for Spot many viewers share about their pets facilitates identification with the android. Yet, in treating Spot like a human would treat their pet, Data assumes the anthropocentric position and turns Spot into an absolutely othered animal. With the viewer affiliating with the altern that behaves like a human, this represents a powerful example of a divergent becoming. 24The appeal of the piece of writing itself clearly lies in the alternation of verbalized matter-of-fact descriptions of the mode of being of a cat with illuminating examples of affect in the animal-alien relationship. While Data grants Spot a form of communication and emotions, he denies him sentience and intelligence. Data thus simultaneously sets himself apart from his pet, while also stressing that their affective tie is not dependent upon a shared language system, but rather on a form of communication relying on haptic and pre-verbal perception. While Data “through a rhythmic stroking of [Spot’s] fur … demonstrates affection,” the cat “illustrates the state of [his] emotion” through his tail and his “subvocal oscillations,” which, in turn, intrigue Data. In the same way that affect is transmitted from the tribble to Spock and vice versa—Spock petting the tribble, the tribble trilling to express pleasure, and Spock calming down—Data demonstrates affection by petting Spot, who in turn purrs. In addition, Data paradoxically addresses Spot in the second person, as usual of odes, while simultaneously pointing out the cat’s inability to comprehend. However, the scene is clearly set up to be a mere humorous lead-in to the episode and the other crew members’ mocking reactions invalidate Data’s sincere emotions. 25While Data oscillates between portraying Spot as object and subject in the poem, s/he is clearly objectified as an insignificant plot device in other ways in the series. Originally introduced as a male long-haired Somali cat in the episode “Data’s Day” (season 4, episode 11), Spot is subsequently turned into a male orange tabby until being referred to as female in the seventh season (“Spot”). In “Genesis” (season 7, episode 19), she gives birth to a litter of kittens, which mainly functions to alert Data and Picard to the fact that newborns are unaffected by a disease that has struck the whole crew, thereby pointing them to the cure. 26Countering this plot-based interpretation to a certain degree is Data likening himself to an “expectant parent” in the same episode (01:25), pinpointing the dominance/affection dialectic representative of parent-child, owner-pet relationships indicated above. Significantly, to be an expectant parent of Spot’s offspring, Data would need to be Spot’s partner of sorts. Additionally, ship counselor Troi comments on Data finding his cat in the debris of the crashed Enterprise with the words, “another family reunited” (Generations 1:46:53; my emphasis). 27However, if Vint highlights the potential of sf for “subversive and new ways of conceiving species interrelations” (21), this potential remains largely unexplored and the subversion is decidedly limited in Star Trek’s portrayal of pets. Nonhuman animals persist in being conceived of as animals throughout the series, their status only subtly challenged. While one could argue for an isolated example of a nonhuman animal gaze, the point of view of the animal is never shared by the audience, a pet is never transformed into a human animal or given the ability to speak sensibly, as would be typical of plotlines in sf texts. 28Moreover, an integral feature of both Haraway’s notion of companion species14 and Deleuze and Guattari’s concept of becoming-animal—mutuality—is turned on its head in that convergent becomings serve to create mutually-exclusive becomings severing the just-established alien-animal bond. In treating Data as a human being, Spot turns Data into a human. In treating Spot like a human would treat their pet, Data absolutely-alienates Spot. The mutual metamorphosis, the “becoming-other” of animal and alien together is clearly at the expense of the nonhuman animal and in favor of the wanna-be human. 29Adapting Kirk’s inclusive humanism, famously articulated by him telling Spock that “everybody’s human” in Star Trek VI: The Undiscovered Country (1991; 1:27:46), it seems as if every alien in Star Trek gets to be human, but no animal does. If, as Vint claims, “[a]nimals … ‘haunt‘ sf, always there in the shadows behind the alien or the android” (12), this proves, in many ways, to be a literal shadow for animals in Star Trek, outshone by aliens, who seem, in contrast, always-already human. 30The examples of convergent and divergent becomings created by way of affective and linguistic (dis)connections discussed so far illustrate the ambiguity at the heart of these becomings. While Richard Iveson argues that Deleuze and Guattari only appear to “give to nonhuman animals an access to a ‘becoming’ that is equal—in power, in affect—to those valorized becomings open to the human animal” (34; my emphasis), I suggest that this promise can actually be fulfilled when considering a particular aspect of interactivity that Teresa Brennan terms “transmission of affect.” Brennan does not locate affect within the interior but as a transaction between bodies. Her analysis repudiates the idea of the modern subject as self-contained and goes back to premodern, “more permeable ways of being” (Brennan 11) that correspond to mutual, convergent becomings outside of language. 31In her analysis of cyborg subjectivity, Sharalyn Orbaugh postulates that, for the posthuman, “affect is the only remaining marker of self” (161), thus defining the subject not so much by sentience or intelligence as by the capacity to feel. A perfect example that “affect does not allow for neat distinctions between subjects and objects” (LaMarre 83) are Data and Spot. It is the interactive nature of affective states that allows Data to align himself with his pet at the same time as becoming human by replicating distinctly human interactions with animals. 33Furthermore, the representations pinpoint the individuality of these beings, portraying Data and Spot as significant others in Haraway’s sense. For example, Spot frequently purrs when shown being in the presence of Data, whereas s/he hates almost all other crew members: Spot scratches Riker, which has him exclaim that he hates cats (“Timescape” 00:43) and hides under the bed, hisses at and runs away from LaForge, who threatens to kill the pet (“Force of Nature” 00:33). Worf’s discomfort at having to sit Spot is mirrored by the feline’s obvious distress (“Phantasms” 29:50–30:23). 34In “Phantasms,” Data experiments with a dream program in his endeavor to become more human and experiences violent nightmares, causing the “unfeeling” android to feel emotions of fear and confusion. In a key scene (see Fig. 3), he watches Spot sleep, then draws a parallel between his dreaming and that of Spot, concluding that the cat’s “twitching and rapid breathing” suggest anxiety as well. He thus conflates his own experience with that of his pet on an emotional, affective level. Nevertheless, Data’s observation powerfully emulates the human gaze directed at the animal which does not return the look (Derrida 11). 35A contrastive example may be found in Data’s attempts to train Spot to jump off his work console. For a brief moment, Data’s and Spot’s eyes meet when Data calls Spot’s name (see Fig. 4; “Force of Nature” 15:18–15:47). Haraway argues that a mutual gaze, demonstrating respect (which derives from the Latin re-specere, which translates as “looking again”) is the basis for a social bond with animals as companion species (When Species Meet 19). When utilizing language, however, Data loses the just-expressed respect for Spot and marks her as inferior by using something akin to caretaker speech: “this is down, down is good, this is up, up is no.” Yet, shortly after, when LaForge is at the door, Data apologizes to Spot for the interruption in their “conversation” by saying “one moment.” This could, again, be interpreted as a form of respect. A humorous conversion takes place at the end of the scene, when Spot meows at Data, Data “asks” for clarification by saying “Hm?” then nods in understanding as he realizes Spot wants to play and grabs a toy. While Data laments that his training has not been successful and Spot might lack the intelligence to understand his commands, LaForge, who has been watching the interaction, comments: “I don’t know about Spot, but it seems to me your training is coming along just fine” (“Force of Nature” 15:45–16:46). 36While the previous examples are primarily used for humorous effect, the following alien-animal interactions are crucial in terms of characterization of Spock and Data, as they are serious in tone and display strong emotions. The movie Generations (1994) marks an important milestone in Data’s journey of humanization, as he has an emotion chip installed that allows him to finally feel the full array of human emotions. At the end of the movie, after the Enterprise has crashed, as the crew is looking for survivors, Data discovers Spot alive. Spot meows, seemingly in greeting and Data hugs her, at which she purrs. Data presses her to his face and cries tears of joy (see Fig. 5). 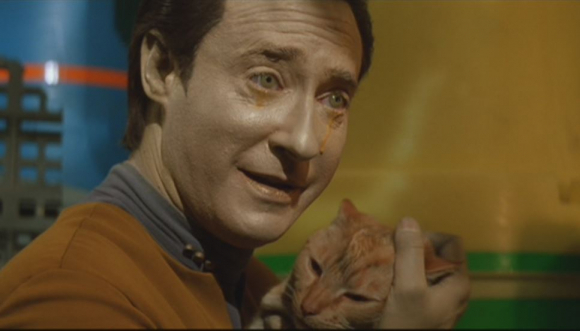 Unable to make sense of the paradoxical emotion, Data tells Troi, “I am happy to see Spot… yet I am crying,” and concludes that the emotion chip might have a malfunction. Troi responds by saying, “I think it’s working perfectly,” indicating the critical step in Data’s emotional evolution (Generations 1:45:50–1:47:22). Fig. 5: Transmission of Affect: Data crying tears of joy at finding Spot alive. Screenshot taken from Star Trek: Generations. 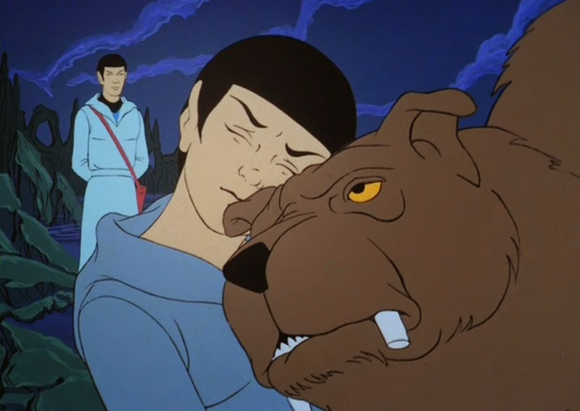 37Similarly, the TAS episode “Yesteryear” (season 1, episode 2) fleshes out Spock’s human side by telling the backstory of Spock’s childhood pet I-Chaya that was alluded to in the TOS episode “Journey to Babel” (season 2, episode 10). The episode has Spock time-travel to his childhood to save his younger self from being killed in the desert. Spock's former pet sehlat, the Vulcan version of a sabertooth, aids him in this endeavor. As he protects young Spock from a predatory creature, I-Chaya is, however, fatally wounded. Young Spock has to make the decision to have I-Chaya euthanized, mourning his death (see Fig. 6). In the episode’s conclusion, Spock tells Kirk that the original timeline has been restored, at the cost of one significant detail: “One… small thing was changed this time. A pet… died.” Kirk wonders, “A pet?” and continues, “Well, that wouldn’t mean much in the course of time.” However, Spock stresses, “It might. To some.” (“Yesteryear” 21:50–22:01). In opposition to Kirk’s off-hand remark at the animal’s insignificance, Spock’s wistful statement unravels his strong, human emotions, even thirty years after losing his pet. 38The examples discussed are powerful illustrations of “posthuman subjectivity retain[ing] important elements of human affect” (Orbaugh 159). They illustrate how language and affect may serve to unite the modes of being of aliens and animals at the same time as having the potential to disrupt this bond by humanizing the alien. 39Basing the discussion of species interrelations in the Star Trek franchise in critical posthumanism, the present paper has considered central aspects of liminality, becoming, and affect. In examining the alien-pet relations through a triangular structure of interconnected becomings, namely alien-becoming-animal, animal-becoming-alien, and alien-becoming-human, I have identified convergent and divergent becomings that complicate a dichotomous categorization and rather present rhizomatic (dis)connections. The pieces of dialogue between Spock and McCoy on the issue of tribbles, between Spock and Kirk on Spock’s pet sehlat I-Chaya and Data’s ode to his pet cat Spot reveal the centrality of language and affect in interpreting the vascillating allegiances formed between human, pet, and alien. Furthermore, instances of transmission of affect between Spock and I-Chaya and Data and Spot are evocative examples of affect disavowing binary distinctions between subject and object. 40As my examination of the representations of tribbles, Data and Spot, and Spock and I-Chaya has illustrated, language, affect, and humor serve to both connect and disconnect these alterns. Whereas Deleuze and Guattari remove the pet from their considerations and maintain that animals are excluded from becoming, I have demonstrated that pets in Star Trek show a capacity to effect a becoming, which is, however, notably not their own. Instead, the converging and diverging becomings presented in the Star Trek franchise that set off a divergent becoming for nonhuman animals effectively reduce them to absolute alterns and mere catalysts of alien becoming. Similar to nonhuman animals providing human access to becoming in Deleuze and Guattari’s theorizing, pets in Star Trek provide an access to becoming-human for alien others. 41Albeit focusing on relational affiliations of liminal alterns, the posthuman potential of these interactions is thus stymied, as the representations fail to live up to the symbiotic promise of mutual becoming of equal value. Safe for an isolated example of a brief mutual gaze between Spot and Data that turns them into equals, the subversive capacity of these relations is not fully exploited by far. Although the relations between these alterns are posthuman in their affective becomings involving human, animal, and machine, they ultimately revert to an anthropocentric vantage point, perpetuate human exceptionalism, and fail to radically reconceptualize posthuman subjectivity. In line with other criticisms reproaching Star Trek for normalizing a worldview derived from, and barely changed since, the Enlightenment (Booker 206), my investigation into alien-pet relations likewise exposes Star Trek’s multispecies utopia as limited to humanoid species. 42Even though Star Trek betrays its motto in regard to animals by not showing them venturing “where no one has gone before,” Ursula Le Guin points to an optimistic reading of the humanization of others, arguing that sf challenges our notions of allegiance and thus might expand our sense of kinship (see Vande Berg 52). Portraying alien characters affiliating with both animals and humans might point to such a gradual expansion of kinship. However, for nonhuman animals in Star Trek, the human-animal boundary remains the final frontier. A.I. Dir. Steven Spielberg. Warner Bros., 2001. DVD. “Acquisition.” Writ. Rick Berman and Brannon Braga. Dir. James Whitmore, Jr. Star Trek: Enterprise. 27 Mar. 2002. UPN. Baker, Steve. The Postmodern Animal. London: Reaktion Books, 2008. Print. Barrett, Michèle, and Duncan Barrett. Star Trek: The Human Frontier. New York: Routledge, 2001. Print. Booker, M. Keith. “The Politics of Star Trek.” The Essential Science Fiction Television Reader. Ed. by J.P. Telotte. Lexington: University Press of Kentucky, 2008. 195–208. Print. Bostic, Adam I. “Automata: Seeing Cyborg through the Eyes of Popular Culture, Computer-Generated Imagery, and Contemporary Theory.” Leonardo 31.5 (1998): 357–361. Print. Braidotti, Rosi. The Posthuman. Cambridge, Malden, MA: Polity Press, 2014. Print. Brennan, Teresa. The Transmission of Affect. Ithaca, NY: Cornell University Press, 2004. Print. “Broken Bow.” Writ. Rick Berman and Brennon Braga. Dir. James L. Conway. Star Trek: Enterprise. 26 Sept. 2001. UPN. Collodi, Carlo; Brock, Geoffrey. The Adventures of Pinocchio. New York: New York Review Books, 2009. Print. “Cosmic Menagerie: A History of Animals in Space (Infographic).” space.com. Web. 26 June 2017. “Data’s Day.” Writ. Harold Apter. Dir. Robert Wiemer. Star Trek: The Next Generation. 7 Jan. 1991. CBS. Deleuze, Gilles, and Félix Guattari. A Thousand Plateaus: Capitalism and Schizophrenia. Trans. Brian Massumi. Minneapolis: U of Minnesota P, 2014. Print. Derrida, Jacques; Mallet, Marie-Louise. The Animal That Therefore I Am. New York: Fordham UP, 2008. Print. Descartes, René. Discourse on the Method. Radford, VA: Wilder Publications, 2008. Print. “Force of Nature.” Writ. Naren Shankar. Dir. Robert Lederman. Star Trek: The Next Generation. 15 Nov. 1993. CBS. “Genesis.” Writ. Brannon Braga. Dir. Gates McFadden. Star Trek: The Next Generation. 21 Mar. 1994. CBS. Gordon, Joan. “Gazing Across the Abyss: The Amborg Gaze in Sheri S. Tepper’s Six Moon Dance.” Science Fiction Studies 35.2 (2008): 189–206. JSTOR. 15 Nov. 2017. Haraway, Donna. “A Cyborg Manifesto: Science, Technology, and Socialist-Feminism in the Late Twentieth Century.” Simians, Cyborgs and Women: The Reinvention of Nature. New York: Routledge, 1991. 149–181. Print. ---. When Species Meet. Minneapolis: U of Minnesota P, 2010. Print. Harrison, Taylor, Sarah Projansky, Kent A. Ono, Elyce Rae Helford, eds. Enterprise Zones. Critical Positions on Star Trek. Boulder, CO: Westview, 1996. Print. Hayles, Nancy Katherine. How We Became Posthuman: Virtual Bodies in Cybernetics, Literature, and Informatics. Chicago: U of Chicago P, 2010. Print. Heise, Ursula K. “The Android and the Animal.” PMLA 124.2 (2009): 503–510. Print. “Individual Animals.” Memory Alpha. Web. 6 June 2017. Iveson, Richard. “Deeply Ecological Deleuze and Guattari: Humanism's Becoming-Animal. HumAnimalia 4.2 (2013): 34–53. Web. 5 January 2018. “Journey to Babel.” Writ. D.C. Fontana. Dir. Joseph Pevney. Star Trek: The Original Series. 17 Nov. 1967. NBC. Kapell, Matthew. Star Trek as Myth: Essays on Symbol and Archetype at the Final Frontier. Jefferson, NC: McFarland, 2010. Print. Kern, Louis J. “Terminal Notions of What We May Become: Synthflesh, Cyberreality, and the Post-Human Body.” Simulacrum America: The USA and the Popular Media. Ed. Elisabeth Kraus and Carolin Auer. Rochester, NY: Camden House, 2000. 95–106. Print. LaMarre, Thomas. “Speciesism, Part I: Translating Races into Animals in Wartime Animation.” Mechademia 3 (2008): 75–95. Print. “Life Line.” Writ. Robert Doherty, Raf Green, and Brannon Braga. Dir. Terry Windell. Star Trek: Voyager. 10 May 2000. CBS. Lippit, Akira Mizuta. Electric Animal: Toward a Rhetoric of Wildlife. Minneapolis: U of Minnesota P, 2010. Print. “The Measure of a Man.” Writ. Melinda M. Snodgrass. Dir. Robert Scheerer. Star Trek: The Next Generation. 13 Feb. 1989. CBS. “More Tribbles, More Troubles.” Writ. David Gerrold. Dir. Hal Sutherland. Star Trek: The Animated Series. 6 Oct. 1973. NBC. Orbaugh, Sharalyn. “Emotional Infectivity: Cyborg Affect and the Limits of the Human.” Mechademia 3 (2008): 150–172. Print. Parks, Jenny. Star Trek Cats. San Francisco, CA: Chronicle Books, 2017. Print. “Phantasms.” Writ. Brannon Braga. Dir. Patrick Stewart. Star Trek: The Next Generation. 25 Oct. 1993. CBS. “Plato’s Stepchildren.” Writ. Meyer Dolinsky. Dir. David Alexander. Star Trek: The Original Series. 22 Nov. 1968. NBC. Schelde, Per. Androids, Humanoids, and Other Science Fiction Monsters: Science and Soul in Science Fiction Films. New York: NYU P, 1993. Print. “Schisms.” Writ. Brannon Braga. Dir. Robert Wiemer. Star Trek: The Next Generation. 19 Oct. 1992. CBS. Schlegel, Michael H. Zug zu den Sternen: Kennen Sie Star Trek wirklich? Meitingen: Corian-Verlag Heinrich Wimmer, 1998. Print. Shapiro, Alan N. Star Trek: Technologies of Disappearance. Berlin: Avinus, 2004. Print. Shouse, Eric. “Feeling, Emotion, Affect.” M/C Journal 8.6 (2005). Web. 20 January 2018. “Spot.” Memory Alpha. http://memory-alpha.wikia.com/wiki/Spot. Web. 3 July 2017. Star Trek: Generations. Dir. David Carson. Paramount, 1994. DVD. Star Trek: Nemesis. Dir. Stuart Baird. Paramount, 2002. DVD. Star Trek VI: The Undiscovered Country. Dir. Nicholas Meyer. Paramount, 1991. DVD. Star Trek Sci Fi Blog. http://startrekspace.blogspot.co.at/2015/03/star-trek-tas-yesteryear.html Web. 27 June 2017. Stevenson, Melissa Colleen. “Trying to Plug In: Posthuman Cyborgs and the Search for Connection.” Science Fiction Studies 34.1 (2007): 87–105. Print. “Strange New World.” Writ. Rick Berman and Brennon Braga. Dir. David Livingston. Star Trek: Enterprise. 10 Oct. 2001. UPN. Taylor, Marc C. “Refiguring the Human.” Mechademia 3 (2008): 3–6. Print. “Timescape.” Writ. Brannon Braga. Dir. Adam Nimoy. Star Trek: The Next Generation. 14 Jun. 1993. CBS. “Trials and Tribble-ations.” Writ. Ira Steven Behr, Hans Beimler, and Robert Hewitt Wolfe. Dir. Jonathan West. Star Trek: Deep Space Nine. 4 Nov. 1996. CBS. “The Trouble with Tribbles.” Writ. David Gerrold. Dir. Joseph Pevney. Star Trek: The Original Series. 29 Dec. 1967. NBC. Tsimpouki, Theodora, Konstantinos Blatanis, and Rachele Dini, eds. War on the Human: New Responses to an Ever-Present Debate. Newcastle: Cambridge Scholars, 2017. Print. Tuan, Yi-Fu. Dominance & Affection: The Making of Pets. New Haven, CT: Yale UP, 2016. Print. Vande Berg, Leah R. “Liminality: Worf as Metonymic Signifier of Racial, Cultural, and National Differences.” Enterprise Zones. Critical Positions on Star Trek. Ed. by Taylor Harrison et al. Boulder, CO: Westview Press, 1996. 51–68. Print. Vint, Sherryl. Animal Alterity: Science Fiction and the Question of the Animal. Liverpool: Liverpool University Press, 2012. Print. Vitamvor, Xavier. “Unbecoming Animal Studies.” The Minnesota Review 73–74 (2009): 183–187. Print. Weiss, Dennis M. “Humans, Androids, Cyborgs, and Virtual Beings: All Aboard the Enterprise.” The Ultimate Star Trek and Philosophy: The Search for Socrates. Ed. Kevin S. Decker, Jason T. Eberl, and Jerold J. Abrams. Malden, MA: John Wiley & Sons, 2016. 180–189. Print. Wilcox, Rhonda V. “Dating Data: Miscegenation in Star Trek: The Next Generation.” Enterprise Zones: Critical Positions on Star Trek. Ed. Taylor Harrison et al. Boulder, CO: Westview Press, 1996. 69–92. Print. “Yesteryear.” Writ. D.C. Fontana. Dir. Hal Sutherland. Star Trek: The Animated Series. 15 Sept. 1973. NBC. 1 I am greatly indebted to Stefan Rabitsch for mind-melding his Star Trek expertise and providing me with the kind of detailed, insightful feedback that could only come from a scholar and true fan. 2 The first time I mention a series of the franchise, the full title will be used. Thereafter, Star Trek: The Original Series will be abbreviated as TOS; Star Trek: Enterprise as ENT, Star Trek: The Next Generation as TNG, Star Trek: The Animated Series as TAS, Star Trek: Deep Space Nine as DS9, and Star Trek: Voyager as VOY. 3 The groundbreaking inclusion of racial and gender diversity in the multicultural crew of the original Enterprise, with Nichelle Nichols (playing communications officer Uhura) portraying one of the first female characters of African descent whose character is not a servant, pan-Asian helmsman Sulu (George Takei) and Russian crewmember Chekov (Walter Koenig), is legendary (see Booker 197). Gene Roddenberry’s original pilot envisioned a woman as First Officer, which was rejected by the network (Booker 208) and resulted in a male semi-alien (Spock, portrayed by Leonard Nimoy) filling the role (Schlegel 36). Additionally, Kirk and Uhura’s kiss in the episode “Plato’s Stepchildren” (TOS, season 3, episode 10) is frequently cited as the first scripted interracial kiss on US-American television. 4 Descartes sees nonhuman animals as automata, animal-machines (fr. bête machine) which lack reason and soul. While granting them the ability to react, he denies them—in line with his famous cogito and Cartesian mind/body dichotomy—the ability to respond and to suffer (see Descartes’s “Animals Are Machines” in Discourse on the Method). This view is contested by the anti-humanists, most famously Jacques Derrida (see Animal). 5 Thomas LaMarre has pointed out that the ability of Klingons, Vulcans, and other humanoid aliens to bear offspring with humans marks these alien “species” rather as “races” than “species” from a biological point of view (91). The species boundary is then clearly drawn between humans and animals, animals and aliens, but not between aliens and humans. It must be noted, however, that terminological distinctions between “races” and “species” in a non-biological context are highly problematic, with categorization being subject to cultural discourse. 6 In this respect, it is also worthy to note a frequent analogy drawn between android Data and Pinocchio (e.g. TNG “The Measure of a Man”), the journey of humanization framed as a coming-of-age story for children. Tellingly, Carlo Collodi’s cultural icon was also appropriated to epitomize an android’s quest to become human in Steven Spielberg’s A.I. 7 The Doctor takes offense at a holographic, speaking iguana and deactivates the animal (see “Individual Animals”; VOY “Life Line”). 8 Sub-Commander T'Pol is appalled by the smell of Captain Archer’s dog (“Broken Bow”), which both distances her from the pet at the same time as it equates her heightened sense of smell to that of an animal itself. Dr. Phlox keeps animals for experimentation and treatment in his sickbay (see Barrett and Barret 63). 9 This disconnect between direct and indirect representation functions as a source of humor as well as facilitating viewer identification with the alien characters (Schlegel 36). 10 The only pet relation including a female owner and her Irish Setter—Janeway and Mollie in VOY—is mostly represented through references rather than actual on-screen interactions. 11 For a detailed discussion of Star Trek technology and media culture, see Alan N. Shapiro’s Star Trek: Technologies of Disappearance. 12 A case in point is a scene from ENT in which a Ferengi attempts to communicate with Archer’s dog Porthos. His colleague reminds him that the dog constitutes a “lower life form,” speculating that it is possibly “the Captain’s next meal” (ENT “Acquisition”). 13 Many scholars in affect theory distinguish affect, the biological, non-conscious, nonverbal, bodily expression of feeling, from emotion—a social expression—and feeling—a personal expression (see Shouse). While I am mostly using “affect” interchangeably with “feeling” and “emotion” here, I do point to the decidedly affective, visceral expressions of emotion in the discussion of the representative examples. 14 Incidentally, in a piece of personal correspondence published in When Species Meet, Haraway compares her dog to a “Klingon Warrior Princess”: “Ms Cayenne Pepper has shown her true species being at last. She's a female Klingon in heat” (192). 15 Data’s emotional capacities are brought about by tech conceits: the dream program in “Phantasms” and the emotion chip in Generations. Manuela Neuwirth is a graduate student in the English & American Studies program at the University of Graz in Austria. She studied at the University of Minnesota and has presented papers at conferences in Austria, Germany, Croatia, Turkey, and the United States. Her research interests include film and television studies, health and illness studies, and the Gothic.